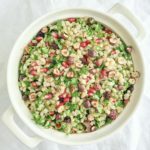 Do I need a Nutritionist or a Dietitian? It seems like everyone is an expert in nutrition. My Instagram is full of them, but few of them actually are. I have people recommending super-foods and supplements they’re making money from. We’re seeing a decline in people seeking nutrition experts. They can find what they want to hear elsewhere. Unfortunately Their chosen experts provide motivational quotes and filtered photos of their new Nikes. If you are looking for credible nutrition advice and are having trouble wading through information online – here’s my guide. If you’re interested in paying for nutrition advice, find yourself someone qualified for the job. A dietitian or nutritionist will make your journey a lot easier. I promise it will be worth it. Hunting for a nutritionist in Perth to help you lose the baby weight, get more energy or get your ailments under control you is likely to leave you feeling overwhelmed. There are a number of qualifications around that do not guarantee up to date and evidence based information. Anyone who calls themselves a health coach, nutritional counsellor, wellness coach, nutrition expert, weight loss consultant or food coach is unlikely to have the necessary education from a recognised educational institution to be providing nutrition advice. What you are looking for is a Dietitian or a Registered Nutritionist. In Australia, nutritionists should be registered by the Nutrition Society of Australia to call themselves a Registered Nutritionist (RNutr). This means they have met minimum study and work experience from reputable institutions and are approved by a committee of senior nutrition scientists. The credential shows that a person is qualified, abides by the NSA code of ethics and is committed to ongoing training and professional development. An Associate Nutritionist (Anutr) has met the minimum study requirements but hasn’t yet had enough work experience to get the full registration. Consider them a qualified work in progress. Nutritionists work in a wide variety of different settings, from private practice to not-for-profits and the food industry. A nutritionist teaches people about normal healthy eating. They can give you nutrition advice that is right for you plus the practical skills and ideas to make a start. The term Nutritionist isn’t protected. Nutrition Coaches, Nutritionists and Nutrition Educators can having varying qualifications and experience but are often the chosen term for people without a university degree. Look for someone who has studied at a well-known university, and is registered with the Nutrition Society of Australia. A good nutritionist will be more than happy to share their qualifications and work history with you. Don’t be afraid to ask. Find a Registered Nutritionist in Perth or have a look at how I can get you on the track to good health. Dietitians in Australia are registered with the Dietitians of Association Australian of Australia as an Accredited Practicing Dietitian (APD). This term is protected by law so only those who are qualified and expressed are allowed to use the title. It is the only credential recognised Medicare as the quality standard for nutrition and dietetics services in Australia (which means the only nutrition service you can claim on Medicare – if you qualify). In Australia, An Accredited Practicing Dietitian has studied an accredited dietetic program at an Australian university. Usually this is a Bachelor of Science and THEN a postgraduate diploma or Masters degree. They also have to keep up with continuing professional development to keep their APD status. Like nutritionists, dietitians work in all sorts of different settings, from hospitals to the food industry to private practices – where you are most likely to see one. They can assess, diagnose and prescribe dietary treatments for many nutrition and diet related conditions. A dietitian will be happy to share their work experience and current APD status with you, just ask. So, which do I need? A dietitian is the only nutrition professional qualified to give medical nutrition therapy. This is really important if you have any medical issues, take medications or were told to see a dietitan by your GP or health care worker to help manage a health condition. An Accredited Practicing Dietitian is the only nutrition professional you will see in a hospital setting and is the only one qualified to give you advice about managing health conditions through diet. 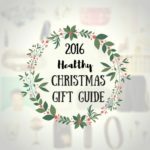 I recommend seeing a dietitian (even if it is just once) if you have any diet-related health conditions. If you don’t have any health problems or have these under control, then a Registered Nutritionist can help. They will help you to find practical solutions to your health, diet and fitness goals. 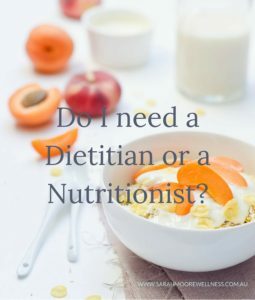 Can I see a nutritionist and a dietitian? Absolutely. You might choose to see a dietitian for 1 or 2 visits for an assessment and some specific advice and then seek the services of a nutritionist to help put the plan into action. In Australia, anyone on a Chronic Disease Management care plan with their GP, can have 6 visits with Allied Health Professionals – if you have a chronic disease or complex care needs you might be eligible. These sessions are shared with services like dietitians, physiotherapists, and psychologists. You may be limited to only a few sessions with a dietitian. Seeking the services of a nutritionist afterwards can be more a more affordable option to continue your journey towards better health. Is my… Personal Trainer/Homeopathy/Ayurvedic practitioner qualified to give me dietary advice? No, unless they also have a nutrition degree from a reputable university. Short courses and online degrees in natural health don’t lend themselves to the complexity of nutrition science. The person may be qualified within their profession but not from a nutrition counselling perspective. Firstly, are they qualified? (APD or RNutr depending on your circumstances). If they are not and yes is the answer to any of the following – find a better source. Is their advice based on strong passionate beliefs about food groups, wheat, gluten, or organic produce? Do they promise quick fixes or money back guarantees? Do they use personal anecdotes and not science to support their advice? Anyone who recommends eliminating food groups, juice diets or is selling supplements does not value your long-term health. Keep looking. Both nutritionists and dietitians are evidence-based nutrition professionals. Look for Accredited Practicing Dietitians or Registered Nutritionists to avoid quacks. If you have a chronic disease, complicated medical history, suspected food allergies – get yourself to a dietitian (even if it’s just once). If you want to change the way your family eats, lose a few kilograms or buy better food at the supermarket – a nutritionist fits the bill.